Most people consider it as bland and in fact we used to eat it when we were sick or needed to eat something light. My brothers would always stay away from it. The only way they ate it was in moong dal khichdi and that too with a very sad face! However I like moong dal, for me it’s as good as any other dal. 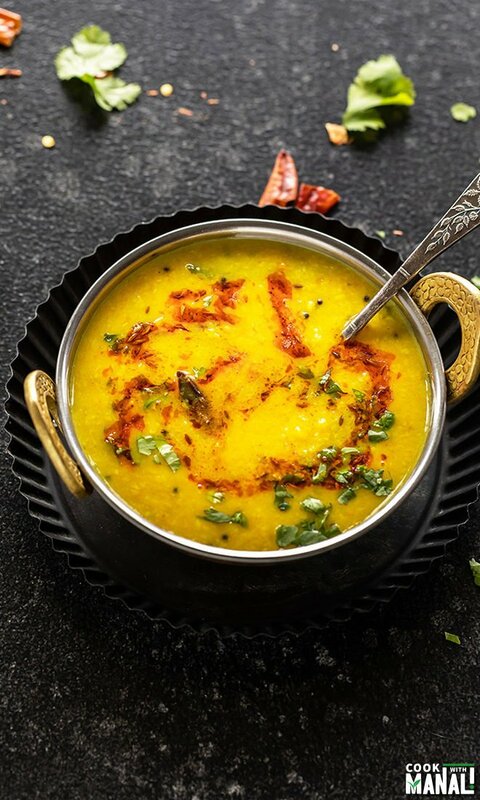 All you need is a good tadka (tempering) and your delicious dal is ready in no time. Moong dal reminds me of my time in Scotland. My friend Deepa used to make the best the moong dal, so Deepa if you are reading this I miss you and your dal! I didn’t really know how to cook back then so whenever I craved for dal and rice, I requested her to make this moong dal and rice. And she always happily obliged! That bowl of rice and dal used to comfort me like nothing else! So, thank you Deepa for making it for me each time. I like that this particular moong dal tadka recipe is so simple. There’s not much to do, the tempering is also very simple. And it’s loaded with garlic and I love that. 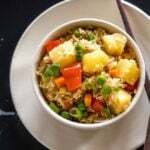 Moong dal and garlic go really well together in my opinion and so I add a ton of it to this recipe. 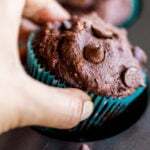 Sometimes you just want to make a fuss free simple recipe and if that’s the kind of recipe that you were looking for dinner tonight then you are just at the right place. ✓ is made using moong dal dhuli (split petite yellow lentils) which is easily available at any Indian store. I have also seen them at Whole Foods. 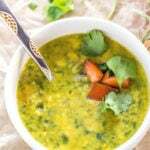 For this moong dal recipe, I used my Instant Pot to boil the dal. You can use your regular pressure cooker or even a stove-top pan. Moong dal cooks rather quickly so it’s one of those dals which would not take too much time to cook on stove-top. 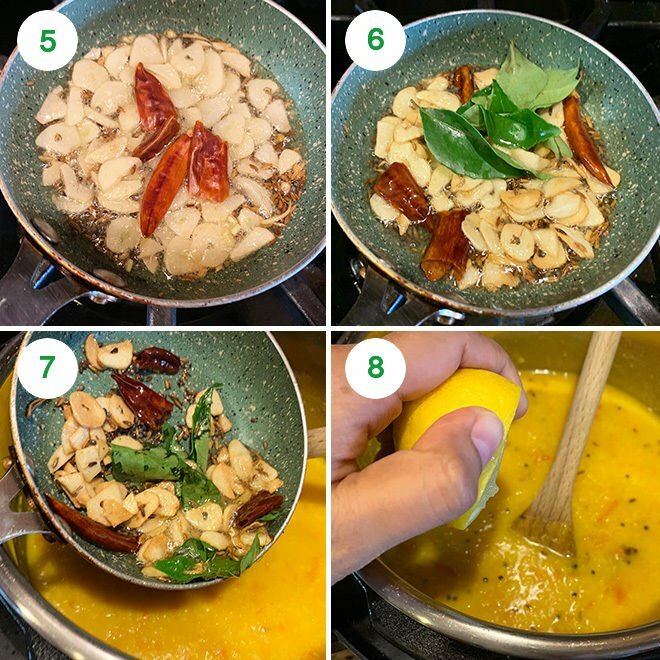 The main flavor of this simple dal comes through it’s tempering or tadka as well call in hindi. For this recipe, I have added a tadka of cumin seeds, mustard seeds, hing, dried red chilies and curry leaves. Here’s few other things that you can add to your tadka- ginger, onion, green chilies, whole spices, ground spices like garam masala etc. You can also do the tadka with ghee, which makes it more flavorful. I have kept this recipe vegan as I used oil for the tadka. 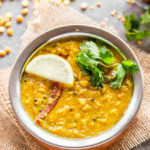 If you want to make the entire moong dal recipe in one pot in your traditional pressure cooker or Instant pot, you can do so. Please check the notes for the same. I really like the strong flavors when we put the tadka in the end so I recommend doing that. If you want to make this on stove-top, first soak the dal for 30 minutes. Then drain the water and add the dal to a pan. Add water, salt, turmeric, red chili powder and chopped tomato. Stir and cook for 20 to 25 minutes until the dal is soft and cooked. Then add the tadka as mentioned in the recipe. 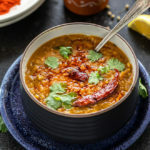 1- To you Instant Pot or regular stove top pressure cooker, add the dal, 3 cups water, chopped tomato, 1/2 teaspoon turmeric powder, 1/4 teaspoon red chili powder and 3/4 teaspoon salt. Stir to combine. If using Instant pot, cook for 5 minutes at high pressure. Let the pressure release naturally for 10 minutes and then do a quick release. If using traditional pressure cooker, cook for 2-3 whistles on high heat. Let the pressure release naturally. 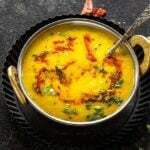 2- Once the pressure is released, open the lid of the cooker and give the dal a stir. 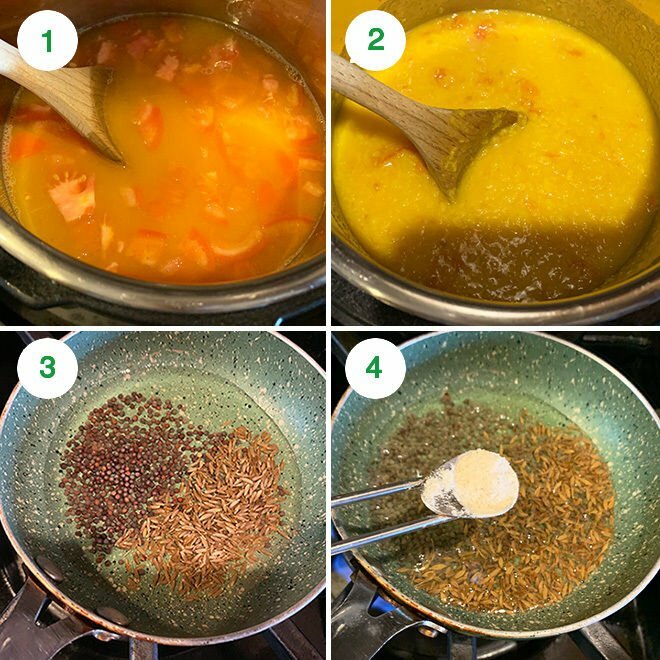 Adjust the consistency of dal at this point to your preference. I added 1/2 cup extra water at this point. 3- To make the tempering, heat 1 tablespoon of oil in a small pan on medium heat. Once the oil is hot, add the cumin seeds and the mustard seeds. Let the seeds sizzle, wait until the mustard seeds pop. 4- Then add the hing. 5- Add the sliced garlic and dried red chilies and saute for 2 to 3 minutes until garlic become light brown in color. 6- Then add the curry leaves and saute for few seconds. 7- Transfer tempering to the cooked dal and stir. 8- Add in the lemon juice, chopped cilantro and mix. 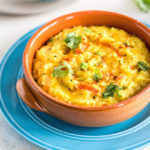 Serve moong dal over rice for a comforting meal! 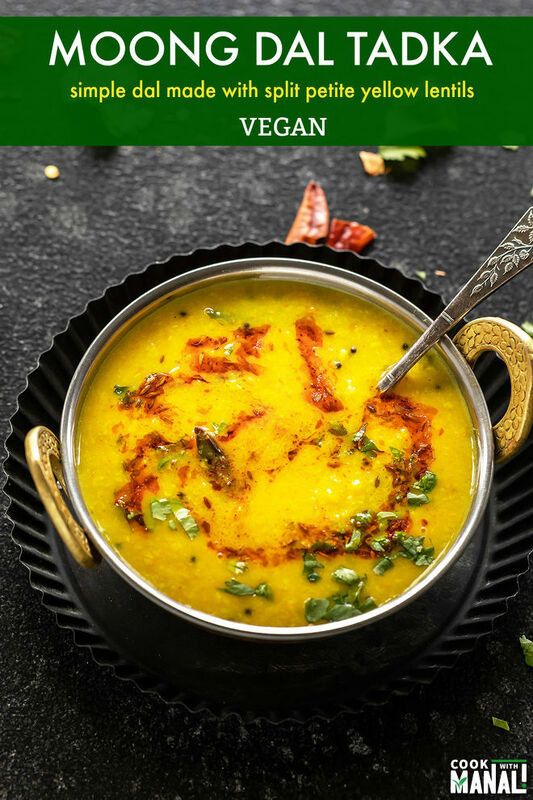 If you’ve tried this Moong Dal Tadka Recipe then don’t forget to rate the recipe! You can also follow me on Facebook, Instagram to see what’s latest in my kitchen! 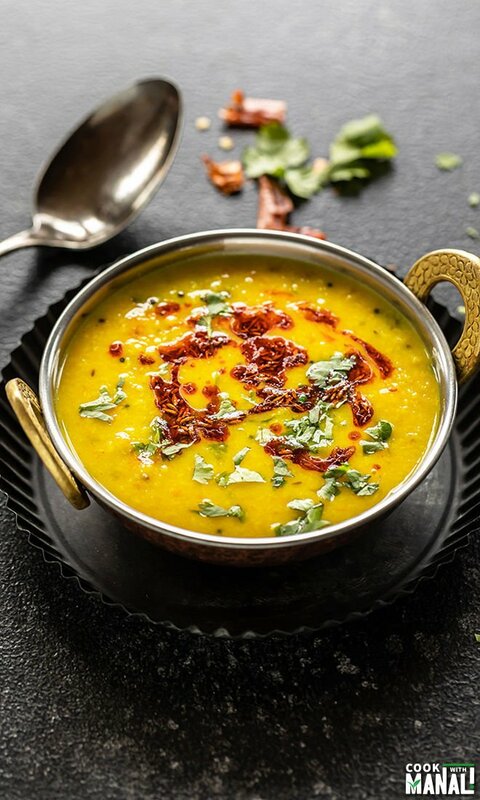 Moong Dal Tadka is a simple Indian dal made with split petite yellow lentils. 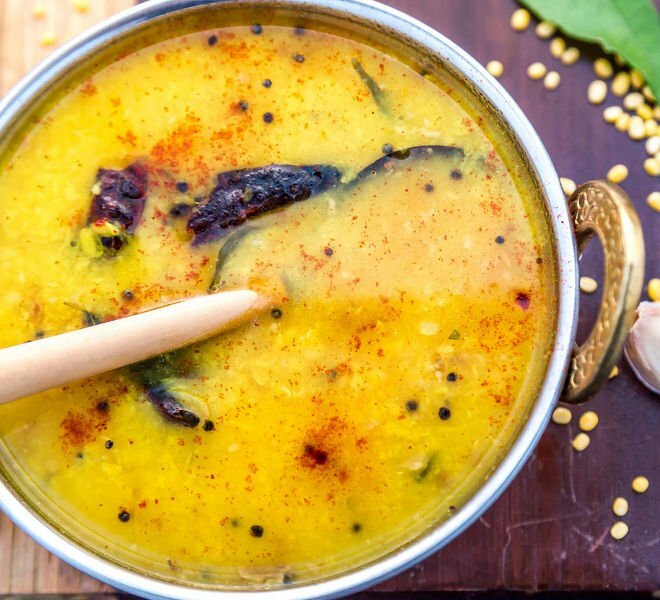 Tempered with mustard, cumin, garlic & curry leaves this dal is also vegan! 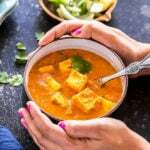 To you Instant Pot or regular stove top pressure cooker, add the dal, 3 cups water, chopped tomato, 1/2 teaspoon turmeric powder, 1/4 teaspoon red chili powder and 3/4 teaspoon salt. Stir to combine. Once the pressure is released, open the lid of the cooker and give the dal a stir. Adjust the consistency of dal at this point to your preference.I added 1/2 cup extra water at this point. To make the tempering, heat 1 tablespoon of oil in a small pan on medium heat. Once the oil is hot, add the cumin seeds and the mustard seeds. Let the seeds sizzle, wait until the mustard seeds pop. Then add the hing. Add the sliced garlic and dried red chilies and saute for 2 to 3 minutes until garlic become light brown in color. Then add the curry leaves and saute for few seconds. Transfer tempering to the cooked dal and stir. Add in the lemon juice, chopped cilantro and mix. 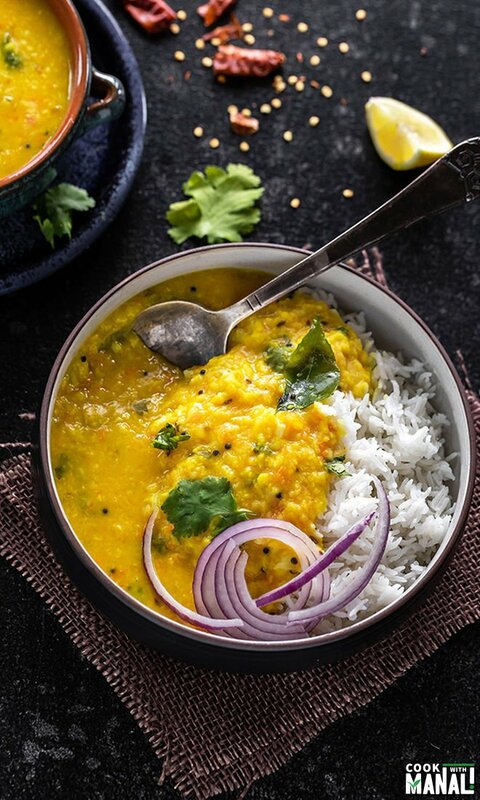 Serve moong dal over rice for a comforting meal! First heat the oil, then add the cumin seeds, mustard seeds, hing, garlic, dried red chilies and curry leaves. Saute until garlic turns light brown. Then add the dal, tomato, turmeric, salt, red chili powder and salt and cook for 4 to 5 minutes at high pressure in your Instant Pot or for 2 whistles at high heat in your traditional pressure cooker. Let the pressure release naturally. Then add the cilantro and lemon juice at the end and serve. 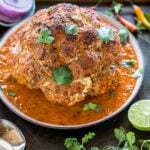 * To make this recipe gluten-free, skip the hing (asafoetida) or use a gluten-free hing. I’ll definitely have to give this a try Manali. I love that you gave us a traditional dish that looks fantastic! Dal looks delicious! ! I love the flavours and the tadka.. yumm!! I love that this recipe reminds you of Scotland! Lol! I think it sounds wonderfully comforting and perfect for the impending soup weather! This was so simple to make and it turned out great! I added only one garlic clove but the daal still carried great flavor. Very thankful to you for this recipe.